It is true there are numerous PDF readers available but in terms of software that can be used to convert PDF to other formats, there are not too many options available. As well, the software or services that are available including freeware often demands that you install some driver files into your computer. But why do you have to install driver files of a program on your computer if you only need to use the software once in a while? Furthermore, some online image to pdf converter software and other formats are quite expensive. 3. A PDF document text may be edited, searched, copied and pasted and exported, unlike an image. a. PDF to image (JPG, Png, Bmp, Tiff). 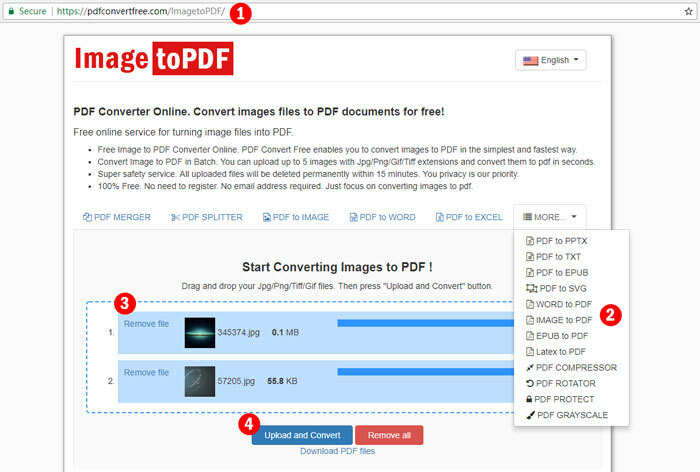 Using this online image to pdf converter is free, simple and faster. For each time, you are able to upload up to 5 PDF documents and subsequently convert them to preferred images format in just seconds. The same applies when you want to convert images to PDF (online image to pdf converter). b. PDF to Word. You are able to convert PDF document to Word in a batch. For each time, you are able to upload 5 PDF documents and subsequently convert them to Word in just seconds. The same applies when you want to convert Word documents to PDF files. c. PDF merger. In a way that is simple and faster, you are able to merge multiple PDF files. You simply drag and drop your various PDF files and subsequently in one click you are able to combine them. d. PDF splitter. With the Free PDF Splitter Online, you are enabled to cut your PDF file in a simpler and faster way into smaller one. There is also a capability offered for you to be able to extract the pages of PDF for the purpose of creating a new PDF. e. PDF to Excel- You are able to convert PDF to Excel in a batch of 5 for each time and complete that in a few seconds. f. PDF to PPTX. With the software, you are able in a simpler and faster way to convert PDF documents, up to 5 at once, to MS PPT. g. PDF to TXT. You are able to convert 5 PDF documents on every occasion and convert them in seconds to text. h. PDF to EPUB. Upload and convert up to 5 PDF documents each time and convert them in just seconds to EPUB. You can also convert the EPUB files to PDF. i. PDF to SVG. Upload and convert up to 5 PDF documents each time in just a few seconds to SVG. j. Latex to PDF. Upload or drag and drop multiple .tex files each time and convert them to PDF documents in just a few seconds. k. PDF Rotator. If you want to reduce the size PDF file then this is the software for that purpose. You are able to choose or configure a degree (90/180/270) according to your particular need. l. PDF Protect. Upload or drop PDF files and in a simple way set the password to lock or encrypt. Your privacy is indeed a priority with this software. m. PDF Compressor. Reduce the PDF file size, up to 5, each time in just a few seconds. n. PDF to Grayscale. Each time converts a batch of PDF documents in seconds to black and white. Step 1. Drag and drop or click to upload your image files on the box or drop zone provide. You are allowed up to 5 images each time. Step 2. There is a “Remove file” button provided for the purpose of removing image files that are unwanted. Step 3. Then simply click the button “upload and convert” and the file will be uploaded and of course converted as required (online image to pdf converter). Step 4. You will be supposed to wait just for seconds for the images to be converted and then you will be provided with a download link. Click the link and download your PDF files from our server in a zip file. this service is great not only just because it is 100% free (no sign up, no Email address and no ads). There are other associated advantages or benefits including that it supports various files and document formats and of course security is a top priority. All the data of your documents will be able to be cleared just in 15 minutes from the server of the service.